Everyone's heard of Hans Christian Andersen, the Danish author of classic children's stories like "The Little Mermaid" and "The Ugly Duckling." But if you were wondering about the significance of today's Google logo, you probably don't know that today is the 232nd birthday of another Hans Christian, a physicist who changed the way we see electricity and magnetism. 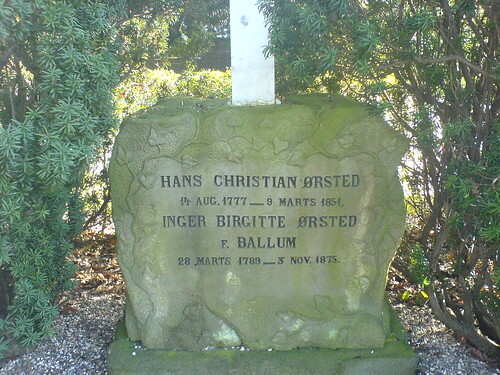 Hans Christian Ørsted didn't pen any fairy tales, although he was a contemporary of Andersen, who fell in love with Ørsted's daughter for a period. But he did work in a field that mystified most people in the 19th century. One evening in 1820, Ørsted was preparing a lecture for his class at the University of Copenhagen when he noticed something unusual. As he set up a demonstration with a live wire, he saw that the needle of a compass that happened to be sitting on his work table jumped away from north, tugged by an invisible force. Then Ørsted knew: electricity and magnetism were not separate phenomena, as physicsts thought. The current through the wire was creating a magnetic field. This was 11 years before Faraday's induction experiments and the birth of Scottish physicist James Maxwell, who would write the laws governing electromagnetism. Children still read fairy tales by Andersen; although they were written over a century ago, they haven't lost their appeal. Neither has Ørsted's simple experiment; I remember it from one of my first science classes. With a wire, a battery, and a compass, you can reenact Ørsted's discovery. And if you can't be bothered, you can visit Florida State University's online java applet lab, with less risk of shocking yourself. Ørsted was rewarded for his discovery by immortality in the form of a park in Copenhagen that bears his name. Physicists also gave units for magnetic field strength his name, but the oersted died out in the fifties when the SI system replaced the old CGS system, based on the centimeter, gram, and second. (Now we base things on meters, kilograms, and seconds, although there is no SI equivalent of the oersted.) Luckily, his name was resurrected again when the Danes launched their first satellite in 1999. Appropriately enough, Ørsted's mission was to precisely map earth's magnetic field. Often during his lectures at the University of Copenhagen H. C. Oersted had demonstrated the non-existence of a connection between electricity and magnetism. He would place a compass needle near to and at right angles to a current carrying wire to show that there was no effect of one on the other. After one of the lectures a student asked, "but, Professor Oersted, what would happen if the compass needle was placed parallel to the current carrying wire?" Oersted said, "Well, let's see," and went down in the history of physics; the student's name is forgotten. Initially, I thought that Google graphic was supposed to be a bomb. I figured it had something to do with Squeaky Fromme, but it seemed out of character for Google. (Continuation from the previous comment)Thanks for the explanation, BTW.